Happy Valentines Day! Today also happens to be my day on the Scraps Inc. Volume 2 blog tour! I loved collaborating on the first book, Scraps Inc. Volume 1 (here is a post about my quilt in that book), so to get to collaborate on another was icing on the cake. This book is beautiful and the 15 quilts from the other contributors are amazing as always. The photography is by Nydia Kehnle and it’s stunning. For the photography inspiration alone this book is a gem. My contribution is Letterpress…you’ll know right away which is mine in the book because it’s probably the most simple and quick to put together! Right up my alley. ;) The solid blue I used is a Bella Solid called Marine…it’s the most beautiful shade I want to use in everything now. This was quilted by Melissa. Scraps Inc. Volume 2 is available here (for pre-sale but shipping soon!). I have some lovely scraps from when I started quilting first that are quite precious to me. I have a scrap (not more than 5″ square) from Chloe’s Closet 1933 collection for Moda. It’s one of my most loved fabric and I treasure this scrpa piece! I have some Pezzy Print charm squares that are kind of hard for me to use. Lovely book! My favorite is some polka dot fabric I brought back from Paris. My most hoarded fabric is a valentine heart print that says “I love you”. I try to use a little piece of it in every quilt somewhere. I have some bonnie and camille scraps that I’m hanging on to! I’ll be making a quilt based on yours due to the many strips piling up around me. As to a “special” kind of scrap… I tend to sort out the Asian and Christmas to accumulate for a special scrappy quilt of their own. My scraps collection is fairly new; right now I think anything with stripes is my favorite. I have a bunch of favorites, usually because they make me think of the project that I bought them for. I have some fabric I bought in Tanzania and I’ve been saving it for years because I’ve never figured out quite the right thing to do with it. The Coin pieces would be a great leaders and Enders project. This book looks great! This is perfect for my next quilt!! Looks like a great book and I love your simple quilt! My most hoarded scraps are several colors of Henna Garden by Sandi Henderson. I have some black and red flower print from Mama Said Sew. Love! I have a scrap of fabric left over from my mother’s collection. It is really old and I will never make anything with it, but I might frame it one day!! I have scraps from my very first quilt! 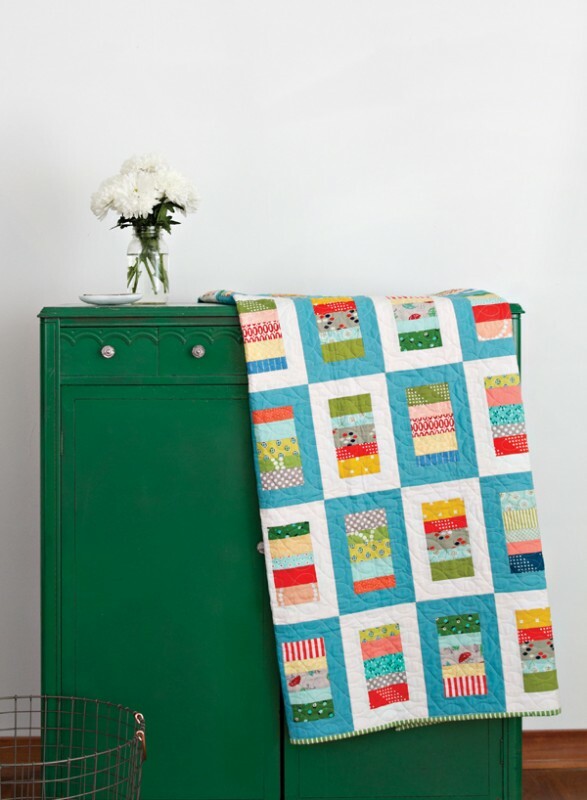 Every post I see on this blog hop makes me want to sew up scrappy quilts! My most beloved piece of fabric scrap is one that has spools of thread on it. I have less than 1/2 yard and it has to be something special to use it! Hmm…usually my vintage fabric scraps are chosen the most carefully. My most hoarded fabric, which I’m now almost out of ( and I’m looking for more!) is a Denyse Schmidt Chicopee fabric, duet dot in red. It’s super awesome for binding which is why I’m almost out of it. I’d say my second is Celebrate Seuss by Robert Kaufman. I guess mine would be a pretty piece of woven red gingham. I can’t bring myself to use it. what a great way to fix my jelly roll quilt. Scraps from my brothers shirts would be my favorite… Since he lost the cancer battle so they make sweet memories. I have a Tula Pink frog that I don’t think I’ll ever use! I have a fat quarter of Heather Ross VW fabric I treated myself to! Love your quilt! Oh my goodness…. I seem to have shelves and shelves of any blue fabric or is that every blue fabric? Oh man! I have a scrap of a vintage fabric that has little gnomes and mushrooms on it. So adorable. I got it at a yard sale ages ago and still haven’t used it. Vintage..I have a small feed sack scrap with a little girl in pigtails. I also treasure a piece of fabric Jean Ray Laury gave me a few years ago. I have a little less than 2/3 yard of a black and white chicken fabric I bought at least 10 years ago. A smidge goes in every black and white scrap quilt I make. Pieces from my late grandmothers stash. I come by it honestly! Thanks for the chance to win! I have spent the last few months organizing my scraps. This book would help me use these scraps. I hoard my Bonnie and Camille scraps–it has to be a special project to dig into them! I have some original Flea Market Fancy scraps left over from baby quilts I made my boys. love your quilt and you’re right about that blue. it is gorgeous. My most treasured scrap is my Heather Ross Gnomes with the blue background. Gotta love a gnome! Oh I have many that I hold onto and then ‘fish’ tiny pieces out of my scrap bin again. Some real favorites are Bake Sale by Lori Holt and April Showers and Scrumptious by Bonnie & Camille. I have lots of scraps that would work perfectly for your quilt, I love it for being simple but effective! I inherited a bag of scrap fabrics from my grandmother. Of course, back then, she cut up old dresses to use on quilt tops. I also have a piece of fabric with baby chicks on it that I have been hanging on to as well! I have some scraps from my grandma’s wedding quilt – feedbag 30 style scraps. Maybe now I’ll find a treasured quilt pattern to use them with. I love scraps! A friend takes a clean trash basket to her quilt retreat and I get all of the gems! So I could definitely use some inspiration for using them. My favorite scrap is some black trees on a cream background. I had a small piece of this fabric, which I loved, and wanted more. I searched high and low and finally found 3 more yards. I now hoard it and use it thoughtfully. I love your quilt (the simplicity, the ease) and also that Bella Marine Blue. I have a small piece I enjoy that I have yet to use. My Australian Aboriginal fabrics are my hoard fabrics, especially the Dancing Spirit print which I have in several colors. I know some day I will come to use them but that day has not come yet. I just enjoy looking at them. I have some beautiful scraps from a dress I made long ago from fabric bought in Hawaii, in ocean colored blues and greens. Waiting for a perfect project…. 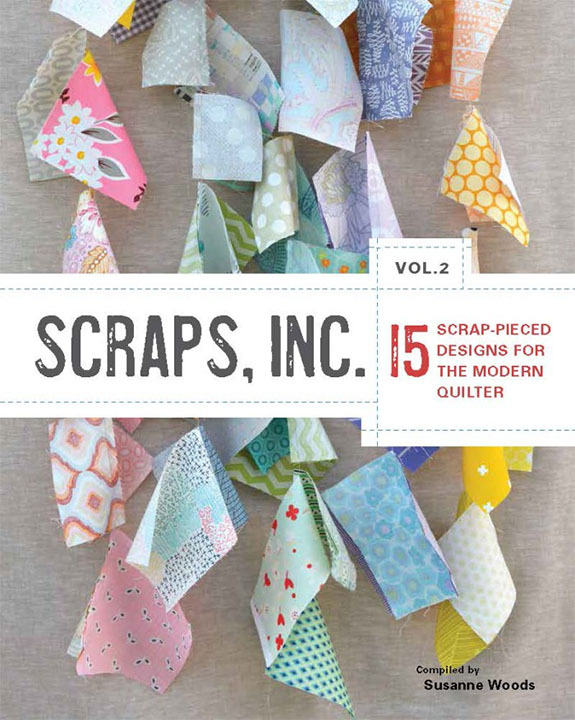 All the gorgeous photos from this book are inspiring me to get sewing on something with those scraps! My most hoarded scraps are Reunion and Mama Said Sew by Sweetwater. I am hoarding Kaffe Fassett’s Chard. I love your quilt! It’s so bright and makes me happy just looking at it. I love the “Nicey Jane” prints – in all color ways, by Heather Bailey. I know they’re older, but SO usable in quilts! The fabric I’m hanging onto and wish I could find more of is the ducks on aqua background in Tasha Noel’s Country Girls line. I used it as binding fabric on a recent scrappy quilt and it was perfect! A very narrow imperfect black stripe. It goes with everything and I can’t find anything like it anywhere! I have some precious Liberty snippets! I agree, that Marine blue is perfect! I have some scraps of Summerville by Lu Summers leftover from the most delightful placemats I made a few years ago. What a gorgeous looking book! My most treasured scraps are the scraps from my wedding dress, I used sone in the bodice of a christening gown for my son, maybe the rest might work its way into my daughters wedding gown one day! I have several pieces of a beautiful purple flowered design. Not sure what I will make with it. I have a dress that I made from Liberty Lawn many years ago, most of the fabric is still in excellent condition. I saved the scraps from my daughter’s bridesmaids’ dresses — I made them as sundresses from three calicos — blue, mauve, and rose. I only have a very few small pieces left, but I put them into quilts for family members — especially babies. I have a piece or two of the the original Heather Ross mermaids that I found in a scrap bin at a retreat years ago. I have an elephant fabric scrap I got from a bag of scraps someone passed on to me that I am trying to get the perfect project for because I LOVE it!!! My most favorite scrap is an orangish batik that has various shades of purples do orange in it. I have some gingham from making baby quilts for my kids, starting 32 years ago. I have a small amount of Liberty Tana Lawn that I got when in London last Fall that is very special to me. Haven’t had the heart to use it yet. A meter of Thai raw silk in a soft green paisley purchased in 1968. I’m thinking this is the year to make it into a scarf. I have some Dutch chintz that I have not yet cut into. I love it. Beautiful blue in your quilt, love it! I have some lou lou thi that I am totally hoarding, it’s so pretty. I sew mostly with scraps and I find myself sometimes not wanting to use a piece because it had been one of my favorites. But I make myself use it and then I am happy! I have some vintage sheet scraps that were my grandmother’s that I would love to put to use. Congratulations! I have a bit of fabric from Hawaii that came home with me from our “second honeymoon”. So many great memories around that trip, including hubby actually saying, “We should find a quilt shop for you.”! Your quilt is gorgeous. The book looks great. I tend to keep scraps from projects together and hoard them all until I find the perfect pattern to make. I think my most precious scrap is probably the scrap of Heather Ross’s that I used to make my daughter’s first dress — before I even knew I’d have a daughter! I have a lime green fabric with splotches on it that goes with everything. I don’t have much left but what will I do when it’s gone? I have some scraps from a sampler quilt made years ago the work with some Amy Butler fabric I love. Now I need a project to use them in. This book would help with that decision. It’s not really a scrap, I have a fat quarter that I bought because I liked the colors in it. When I opened it up it was like those paintings you see on the walls of caves in the desert. It had Indians and their horses and bows and arrows. I’m thinking about just decoupaging it to a canvas board and putting it on the wall. Too pretty to cut up! I have a couple of fabrics that I don’t throw away even the smallest scraps. One is the Ocean blue range from Fig Tree’s California Girl line. The other is the red with white daisies from your Oh Clementine; if I had know how much I was going to love it, I would have found a way to buy a bolt. I have some scraps of Happi by Amy Butler that I would like to put into a quilt for me. I keep holding on to the scraps of batik fabrics I had made when we lived in West Africa. I have April Showers that I love! Oops, hit submit too early. This looks like a cool book. Thanks for the giveaway. Carolyn Friedlanders Doe collection, the orange print with the circles. Love it. Thanks for the opportunity to win. Your quilt is beautiful. HI, it’s some fat quarters of “Durham Anew”! Can’t cut into those>LOL! I have a blue green grid Denyse Schmidt fabric that I love for bindings. I can hardly convince myself to use it. My most treasured scrap of fabric is a vintage pic that was pretty small when I received it. It has whimsical animals in soft colors and I’ve seen nothing like it since I started sewing. I’ve managed to slip it into a few projects and may have one or two little snippets left. Im a fabric hoarder! I love the bright cheery fabrics…fig tree, bonnie and camille, etc. Those I really hoard. I have buckedts of scraps and I need to do something with them……. I still have an unopened Happy Go Lucky Jelly Roll. (My first jelly roll). I really need to just break down and make a quilt with it! Favorite scrap pile is my DS collection from Joann’s. I just may a a piece of all her fabric to be found there!! My most treasured scraps are some Liberty charms I splurged on. I’d have to find the PERFECT pattern to decide to finally use them! Of course my most treasured scraps are the feed sacks my mother left me. They are quite old and beautiful but most of all so full of memories. My most treasured scraps are from a quilt I made my parents about 5 years ago. Chez Moi by Moda. Its green and pink. I am not sure what to do with the odd pieces but one day I will get there. I’m getting closer. Mom and Dad are both gone now so I want to be sure I do something special. I just finished a quilt with my treasured red, black, and white fabrics. So I guess it is no longer just a scrap. My happy go lucky scraps!! What? One favorite? I buy fat quarter bundles to love and pet. Can’t possibly open them. That would mess up the beauty. Someday I will have to but not yet. I have a whole yard left of a fabric from the mid 1990’s from Concord Fabrics, a Joan Kessler design. I just chopped up a treasured piece of a years-old Hoffman challenge print today. It has beautiful, bright colors, with a paisley/feather design that I absolutely love. I finally decided I would never make a whole project around it, so I used it on a scrappy quilt backing today. I think I’ll get more enjoyment out of it in the back of that quilt than buried in my stash. Mine is a few yards of African wax that my sister brought back from her time in the Peace Corps. I don’t think I have a most treasured scrap. If I love it, I will certainly use it. :) I do find that I never have enough red or yellow scraps…which is funny because they aren’t my favorite colors. They just seem to be what adds a little something to a scrap project. Many of my hoarded fabrics never make it to the scrap stage because I haven’t cut them! I do have some scraps from several Zen Chic lines that I hope will multiply in the scrap bins so I never run out! My scrap box is overflowing at the moment but I have a very pretty green moda that I love to fondle. I have a half yard bundle of Hope Valley that I keep taking out and putting back. It drives me crazy as I have some yardage for quilt backing. I just cannot bring myself to cut it up. I love my fat quarter bundle of Botanics can’t seem to cut into it. Thanks for the chance to win. I only make fraudulent scrap quilts (I buy tons of new FQs and layer cakes, and chop them up into little pieces so my quilts will LOOK scrappy!). But my most treasured, hoarded scrap of fabric is actually a sinfully sensuous leftover bit of an F. Schumacher 100% silk cut velvet upholstery fabric. It’s left over from a design client’s project, and it’s not big enough for me to do anything with it, but I just like to take it out and pet it from time to time… It’s got a basket weave pattern in shades of crimson, burgundy and ivory, very geometric and it changes color depending on how the light hits it. I hoard Hometown from Sweetwater several years ago. It’s my all-time favorite line, but I’m going to use it this year! I have some alphabet toile I treasure. Thank you for all the great projects shared. My most treasured pieces are left-over scraps from two wedding dresses. My grandmother’s 20 x 8 Inch irregular piece is beautiful cream brocade, made in 1898. My wedding dress was ivory sanded satin with a leaf pattern. I used some of mine in dressing dolls. That was 1952 vintage. Nice quilt. I love scrappy quilts, especially when I can tie in fabrics from other projects. I tend to hoard many fabrics until one of my grandkids find it and ask me to sew something for them. Nothing wrong with quick and easy! Your quilt is great! I am hoarding some Tula Pink fabric. I have some “vintage” Liberty of London – waiting for the perfect project! love these scrappy quilts.. thanks for the opportunity! Oh my goodness, I hope I win this book!!!! 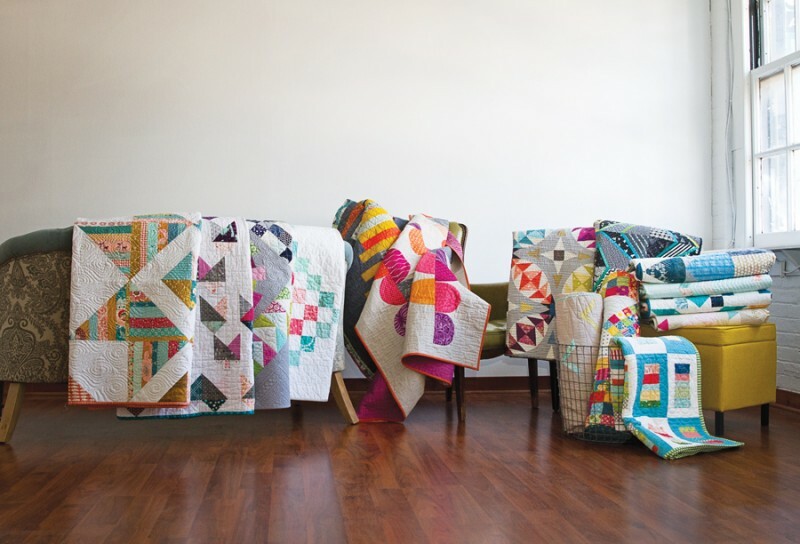 I have seen quite a few bloggers’ quilts and they are all so gorgeous! I agree that the blue you used is just beautiful! It looks great with all those scraps you used! It’s hard to pick a favorite scrap. I definitely feel sad when I use the last little piece of almost any fabric. I’d have to say the one I buy over and over is a red diamond print with gray squares. I saw it first in a Lori Holt quilt in her first book and then I saw it on Instagram destash two years ago and picked it up. Turns out it’s a Joanns fabric! No joke!!!!! Since then I’ve bought it two more times on the destash so I have about a yard of it now in my stash! Love your quilt! I have a hard time using up any text print-they are currently all my favorite and I am so afraid that I will use all the text prints up and not be able to find them again. I tend to guard any text prints, Tula Pink or Cotton+Steel fabrics! The photos from this book are just stunning! Thanks for sharing! I don’t have any very old scraps but my most hoarded scraps would be any Bonnie and Camille! I hoard all my pink fabric! Just love it! Love your quilt too, gorgeous! My first scrap of cotton and steel was given to me last year,mand I stretched it over three projects.mit isn’t available from many LQS in NZ, so was a real treasure. My favorite scrap is a cream and pale green Toile. I also love the blue in your quilt! I hoard a lot of fabric not just my quilting fabric haha. The one set of fat quarters I bought at Purl Soho on a trip to New York (my first overseas trip) is being hoarder away in my quilting drawer. They look so lovely together and I’m waiting for just the right project before cutting into them. I have a piece of pink and white rose material I used for my daughter’s blessing blanket. I love the memories attached to it. I have scraps from my first quilt that I made 2 1/2 years ago from when my youngest went off to college. I fussy cut “Ole Miss” and “Go Rebels” and I have a few left. I’m not sure what my current hard to use fabric might be, but back before a variety of solids were readily available, I had a strange pumpkin orange that I had a hard time using because I was afraid I couldn’t replace it. I love the Marine Blue in your beautiful quilt. I have some of that leftover from a quilt I’m making! I save all my scraps but my favorites are from Anna Marie Horner. I love your quilt and the blue! I hoard the b&c scraps. I used to have a lot of blues but I have used them all up so now it is 30’s but in a month I will use them all up. I have a few scraps of red and white fabric that my mom saved from the Christmas when she made aprons for herself and her best friend. I love those little bits and include one or two in any special scrap quilt I make, if it is staying at our house. My most treasured scrap is a piece of orange tone on tone, which is odd because I loathe orange! Sometimes you just need some orange…snowman noses, birds’ beaks and feet, and a few flowers. No matter how much I dislike orange, sometimes it is the punch that is needed. Love the scrappiness with the two color solids! And I have one lonely fishie from Heather Ross which I cherish and hoard for that very, very special project! Cabbages & Roses Hatley print…so pretty:) I have also squirreled away some lovely Liberty of London fabrics. You had me at Marine with your new quilt! Blue is one of my favorites and there is nothing wrong with easy. That’s why I like so many of your patterns! I horde Tula, Bonnie and Camille and Denyse Schmidt fabrics and have chosen to use Denyse’s Ansonia fabric in blue and green color ways for my “Splended Sampler” project. Once that is done I will have some of those scraps to play with. Thank you for the opportunity to win this wonderful book! Wonderful book and great quilt! I have a long hoarded piece of antique chintz that I know I have to use one day, but is still waiting for the perfect project. Thank you for the chance to win. My favorite scraps are leftover Peanuts fabrics from the first quilt I designed. I not only love them because of my design, but I made it for my son and daughter-in-law because they both adore anything Peanuts related. I had such fun searching for the right fabric and love the scraps for all the fun memories! I always seem to find a “favorite” in what ever quilt I am making, which then can turn into an internal struggle within myself. Do I use it, don’t I, arrgh cut it, just do it. And then I hoard every little piece left over. You should see the size of my scrap bin, lol. One day, I WILL use them, one day, but the memories in there mean a great deal to me. I have a few scraps of Moda’s ” Make Life” by Sweetwater that I adore! & thanks for the giveaway! My most hoarded scrap is a piece of Heather Ross goldfish. Not sure what I’ll use it for but I just adore those tiny little fishies! I don’t really play favorites with scraps but just the other day I found a bit of black fabric with multicoloured teapots all over it that I used in my first sampler quilt….more than 15 years ago. I am going to use it in the sampler I working on right now. Some indigo from the first quilt I made will find a home in this, along with scraps from the spring greens of the next one. This is a quilt I can make! I treasure all of my Kate Spain fabric scraps! This book is just what I need! I have been scrap happy lately, trying to use up lots of random bits of fabric. This book looks like such fun! I missed the first round of Katie Jump Rump, so i might have overbought Flea Market Fancy. Like maybe 6 FQ bundles. Yikes. This would be a great pattern to make with it since it wouldnt make me use too much of one print. This looks like a great book for all of my scraps! I have a bag of Bonnie and Camille scraps that include some fabrics from every line except their first. It is fun pulling from that and combining all the lines into one project! I have some Tula Pink scraps that could put my youngest through preschool – so hard to use! What a pretty quilt! I love that blue. I have some scraps from friends which makes them precious to me because they remind me of the generosity of these dear ladies. I love your quilt! I also love that the patterns I’ve tried from your site have been so easy to follow and they are beautiful :) I love the collection of small dots scraps that I have and am thinking they would look great in this pattern. Love the colors in your quilt! I currently hoard numerous fabrics but some vintage feedback fabric and some Liberty of London prints from the 80’s are favs! I have so many treasured scraps accumulating I need to use them up! I couldn’t pick a favorite really! I want to stop what I’m doing and make this quilt right now! Love this! I have a couple of your scrap packs that will be just perfect!! Thank you for the chance to win this book!! Feed sack scraps are my favorites. They are so unique, close to 100 years old, and nothing else looks like them. I love that you are giving away a copy of the book – I just ordered Vol 1 so would be nice to have the second one. As for scraps I couldn’t pick a favorite as I have enjoyed every quilt I have made and love that there are scraps left over to use in other quilts. I’ve got a whole bag of precious scraps waiting for the right project. These scraps are from projects I’ve made and scraps that I’ve gotten from friends of fabric I like a lot! Thanks for the giveaway and a chance to win this fab book! Hi Allison, so cool to meet you via Blog and the Scraps Inc, Vol 2 tour! My hoarded scrap(s) are from Jennifer Sampou’s “Native Plains” collection. Oh my I might just have to use ’em up w/your pattern. I have some scraps from the original Katie Jump Rope line that I don’t want to use even though it has been reprinted. I also have some Heather Ross and Ruby Star Shining pieces I don’t want to use because they’re so rare. I love your quilt! And I love scraps. I would say my most treasured scrap is about a half-yard piece of 3 yards of quilting fabric given to my husband and me as a wedding present from his maternal grandmother nearly 30 years ago. She was a quilter and old-school. Giving fabric was a gift of love. I used some of it in my first 2 quilts I made a couple of years after we were married. But I just keep hanging on to that last piece as it means so much to me I can’t bear to cut into it. She would probably think that was a waste of good fabric! I don’t have any scraps that I hoard, although I must admit that I had a little bee print that I was kind of sad to use the last of. I need this book. My scraps may engulf me if I don’t start using them faster. I have a few cat prints that I can’t dare cut into. Love your quilt, Allison. My favorite scraps is anything Denyse Schmidt especially Flea Market Fancy which sadly is almost gone. I have not been quilting that long, so my stash of scraps is not large enough (yet!) to make an entire quilt! But I have my Cotton & Steel scraps separated and have been using them to make blocks for a Farmer’s Wife quilt! I LOVE your quilt. I want to make it now! I have some special scraps from a dress that I made that I hope to put in a quilt someday. Love that Letterpress quilt. Been looking for a good idea for my littlest boy. I like that one. I have the top sheet that came off of a bed that my great grandmother had. I don’t remember her but the sheet is from the 70’s and I just love it and it makes me feel close to her. I used some of it in a quilt that I made for my daughter. I have quite a bit left but can’t decide what I want to use it for. Cute quilt! I’m so excited about this book. I hoard all of my little Carolyn Friedlander scraps. They work in everything. Thanks for the giveaway! I have a small piece of Katarina Rocella’s Indelible Spirodraft print that stays in my grey and black scrap bin. It makes me happy to see it, but maybe I need to let it go! Cute and easy quilt! And I love that blue too! I am going to buy some of that too. Love the simplicity of your quilt design and the beautiful blue. I can see why you love it. My favorite piece of fabric is probably a small piece of an Orange Kaffe Fassett that is out of print now. Can’t bring myself to use it yet. I have some early Alison Glass fabrics that I like but I’m afraid to cut into them! Love your quilt. I have visions of making this quilt! I love the uniform size and all things that are uncomplicated. I hoard/save Christmas scraps. I’m a newbie quilter so there’s not a whole lot in my stash yet! I’ve been hoarding some Kate Spain fabric. I can’t remember the collection name, but I love it! your quilt is so happy and perky — love it! I am not sure of a favorite from my stash but if I had to pick one it would definitely be a batik. This book looks great! I have a probably with so many fabrics, I love to look at, but don’t want to use. They all make me smile! You will think I’m silly, but I have one fat quarter from the old Benartex line from the book The Quiltmaker’s Gift. I love it sew much but I can. not. cut. it. So, I recently decided to use it as a medallion, adding squares all around either from scenes from the book, or maybe one each of the squares on the endflaps…TBS still. Sigh. I can’t remember the fabric line, but I still have scraps from the very first quilt I ever made, a simple attic windows, that I just can’t part with – It reminds me of where I started on this quilting hobby that has no end. This book looks great! And so does your quilt! I love most any Alison Glass scraps I have. I was given a FQ of little gold fish on light blue background – designer Heather Ross; her Lightening Bugs collection. I used it all in an online block swap last year. It wasn’t until later I found out it’s pretty hard to come by. And I’m still glad I did – hope those who received my blocks liked it as much as me! Congrats on being published and part of this AWESOME book! This looks like a great book!! I especially love the blue/white background fabric combo you used!!! Great Job!! I have some red and white striped fabric leftovers that I love and want to use, but I’m afraid of using it in the “wrong” quilt! My ABSOLUTE FAVORITE FABRIC is one by American Jane Patterns from the “School Days” Collection. Red is my favorite color and this fabric is red with dot-to-dot pictures on it, half finished…takes me back to coloring books and crayons :). Love your Blog and Thanks for the give away! love your quilt! great idea for scraps. I love vintage sheet fabrics. Thanks for the chance to win. The fabric leftover from quilts I have made my grandkids are treasured. Great way to use scraps! 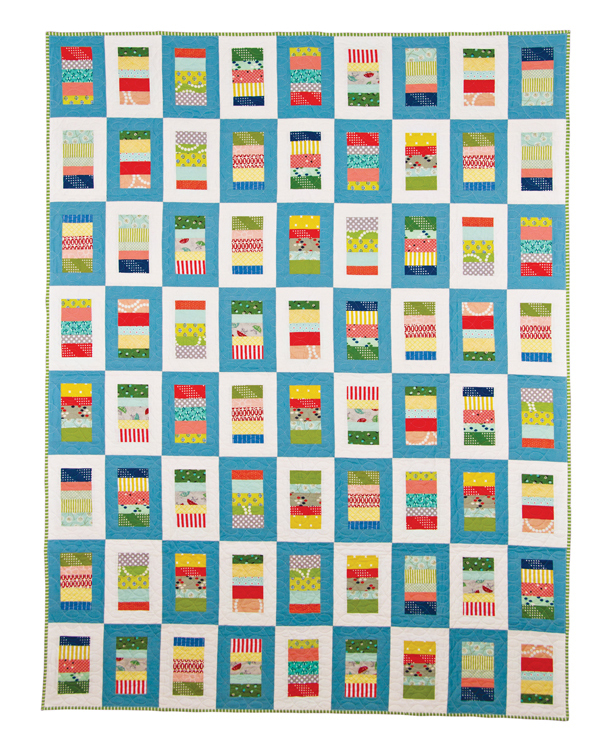 Thanks for sharing… I will start saving my scraps for a quilt like this. I have some Tula Pink Racoons which I am saving for something special, plus some Bonnie and Camille, Ruby and Bliss I treasure. Most definitely my video game fabric! I’ve probably spent too much of my fun money on it, but hey, it is fun money! I have a watermelon red with black seeds that I used to make a romper for my now 30-year old — I must have bought a ton of that fabric! I keep tucking it into all kinds of projects. Your new book looks great , I have so many scraps !! My favorite fabric scrap is a piece of bright, colorful confetti fabric that I bought years ago that is of course not available any where .I have a 2′ strip that I use as a ribbon so I can still enjoy it !!!! Baby Jane scraps, or Lucy’s Crab Shack – I use the itty bittiest scraps of them because I love them so much. How fun! Love your quilt! My most treasured scraps are my few last bits of Ruby by Bonnie and Camille. I have a tiny treasured stash of vintage Liberty tana lawn squares. Saved by my Mum over many years from fabric sample mail order books. I have some lovely vintage scraps from my grandmother gave me that I can’t bring myself to use. I do not think I hoard scraps. I have had a few that were hard to use the last bit of; however, I still did it! I cannot remember their names (one was a Flea Market Fancy print in blue), but I remember them when I see them in my quilts. I have a couple of my most treasured scraps – some Tula Pink ladybugs in pink and in yellow from her first collection with Moda and a scrap of Heather Ross’ goldfish fabric – I use them wisely and I’ll be sad when they’re finally gone ! I absolutely adored the first book and can’t wait for the second!! I have a 6 x12 inch piece of citron striped fabric from connecting threads that I have been holding onto so tightly–my favourite by far! I still have some floral fabric I bought when we lived in Japan…I covered a huge tea box with it, then one of our dogs tore it so I stripped the box down to it’s original wood finish and I kept the fabric as I still love it—28 years later! My most hoarded fabric are some Amy Butler scraps that I was given. Love the quilts in this book – would be a great project to make each one of them! My favorite scraps are any Kaffe Fasset fabrics I have used! I love pink and white fabrics, so my most treasured piece of fabric is a pink floral, Sakura Park, by Sentimental Studios. I have two: a pretty pale yellow floral by Verna Mosquera, and another one that’s beigey with small green vines on it called Charlotte, although they are not exactly scraps. I have quite a bit of each, I love your simple quilt. I’m so into simple these days! I have a small piece of Heather Ross vw bus fabric. It is about 14″ x 12″ and I love it too much to cut it. Most treasured…Tula Pink the ships, and a small floral in mainly red from dresses I sewed and hand smocked for my daughters. I made a rosebud quilt from some ’60’s mother/daughter dresses for my mum’s 75th. That fabric had sweet memories. I’m new to the quilting world so I don’t have a huge stock pile yet… most of my fabrics are C+S so I would have to say them! Love the quilt – what a great design! My hoarded fabric scraps I’ve had for 50 years ago from my favorite dresses made in HS. Maybe I should just frame them. I have an 8 inch square if Heather Ross swans hiarded away! Letterpress is so fun Allison and a fabulous way to use scraps! I love Volume 1 and just now ordered Volume 2. Thank you for the coupon code! My most treasured (hoarded) fabric is a brown fabric with cupcake sprinkles. I try to buy some whenever I find it on Etsy. In fact, I just used some while making your “Playful” quilt. The fabric scraps that I hoard the most are ones with words on them. I like ones especially that look like old book pages or typewriter pages. My goodness, Allison, I love this quilt you created! Best scrap…why do I always think of Flea Market Fancy, yup, I have a few of those in my scraps! :) Thank You for the chance at a free copy of this great book. I have a small basket of scraps from the fabrics my grandma used to make my childhood quilt and many dresses, blouses, and shorts. It’s oh so special to me! Beautiful! I just used up my scraps from Moda’s Lollipop line. I’m not sure if this counts, as it’s not a sewing scrap, but my most treasured scrap of fabric is a tiny piece, maybe 1″x4″, of the nightie my mother was wearing when I was born. After I’d arrived it was in no condition to ever be worn again, but before getting rid of it she cut away the clean part to be my security blanket. I’m now 27 and I’ve only got a fragment left, and that’s sewn onto a calico backing to stop it physically falling apart. I have a small tote with log cabin leftovers from my Mom’s last log cabin quilt. They are cut, and I think I would have enough to make a log cabin small lap quilt or wall hanging, maybe a table runner. I look at the fabric and am afraid I will not make a perfect log cabin as the ones I remember in my heart that my Mom made. I don’t have any of her log cabin quilts so this fabric is all I have. I don’t want to mess it up. So I cherish it. Sounds stupid. I should just do it. I can do a log cabin block. Then I could see the wall hanging every day. Old Heather Ross lines with the Disney characters…. I have a lovely white on white striped fabric that is more than 15 years old but oh-so modern still. I’m down to my last fat quarter. I have some Lotta Echo flower scraps that I love! I have (had) a great piece of daisy fabric that went into a number of scrap quilts! I think I have used all but the tiniest scraps of it up!!! It was a cheerful yellow and green! I am just getting back into quilting, and I’m honestly saving my stash of Wildflowers until I’m a little better at this again! It is such lovely fabric, and my favorite is the large zinnias, especially in navy and gray. I can’t decide which I love more! I have a fat quarter of Architextures (the green trees) that I want to use but want to hoard at the same time! Thanks for the giveaway. I have an old feedsack which has patterns of Hawaiian motifs! It’s great! I have a few pieces of material that I am hoarding for that perfect quilt. 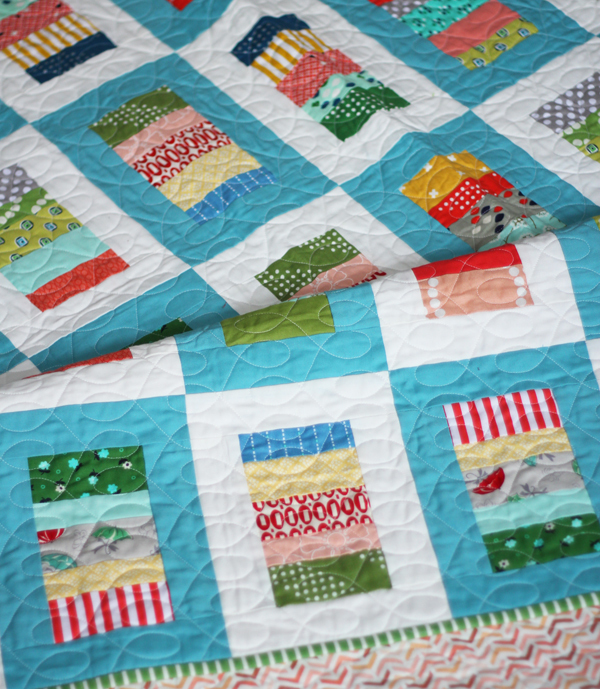 Of course that perfect quilt never gets made…. Would love to win! I just love fabric, not sure I have a favorite! That blue is terrific, and it’s a bright, fun quilt. One treasured scrap is “Sophie” from Chez Moi, (I think) as it is my youngest daughter’s name. My favorite scrap is a piece of Lizzy House Guising Ghosts. I’m already planning (in my head) my version of your quilt. My favorite scraps are my elephant fabrics. This book looks terrific and I love your quilt!! That Marine blue is absolutely gorgeous! I have been holding on to some of American Jane’s early prints!! Sooo cute- every small project made brings a smile to my face! I love your quilt! I have some Tula Pink Saltwater prints that I have been hanging on to. I also have scraps of my daughter’s baby quilt that I treasure. My most treasured piece is an old Heather Ross VW bus print. I love it. I have a test swatch (8″ square) of ‘quiet time’ from spoonflower that will one day be the centre piece of a quilt for some very special someone. This really neat fabric with ‘real’ looking cats. Anything red, white, or blue! I have some adorable jungle animal fabric that I bought years ago. I use little bits here and there in projects for people I love (but I have to *really* love them in order to part with it…haha). I have so many scraps and am making a string quilt. But it seems like the more I use, the more it multiples. I really like the pic of your book. Sure hope I win. I have 2 FQs of the VW busses from Lightning Bugs by Heather Ross – I haven’t had the nerve to cut into them yet! I love them too much! I LOVE your quilt! I want to make it RIGHT NOW! Love scrap quilts. Your quilt would use up lots of stray pieces. Thanks for sharing! I love this quilt and think it would be perfect for a new quilter like me! Thank you for sharing.